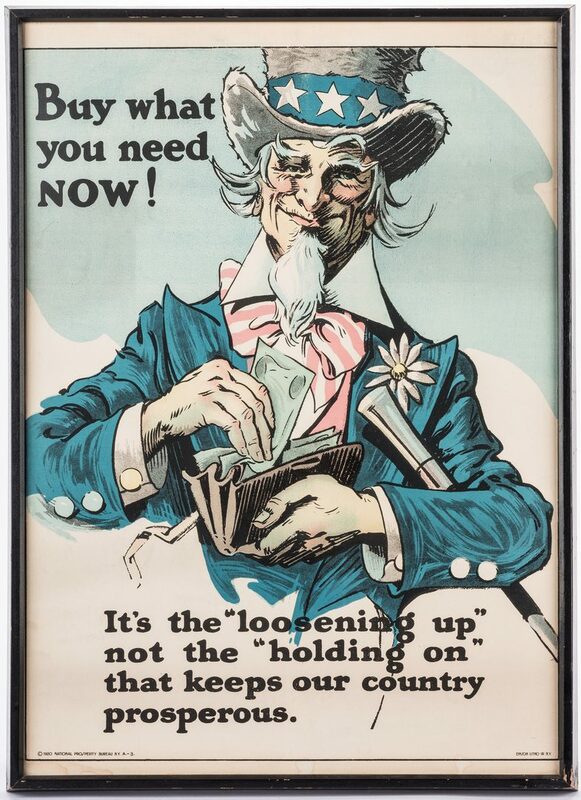 1st item: WWI National Prosperity Bureau/N.Y. 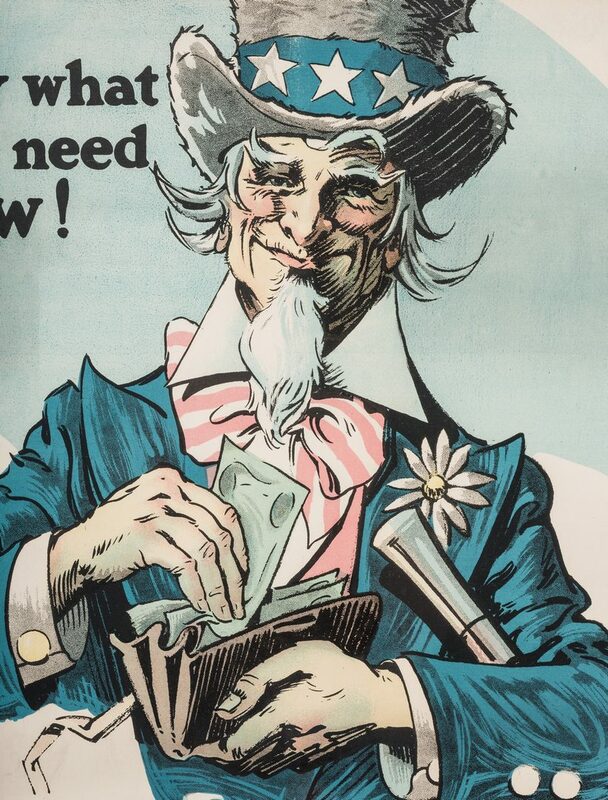 propaganda poster depicting Uncle Sam pulling money from a wallet, reading "Buy What You Need Now. 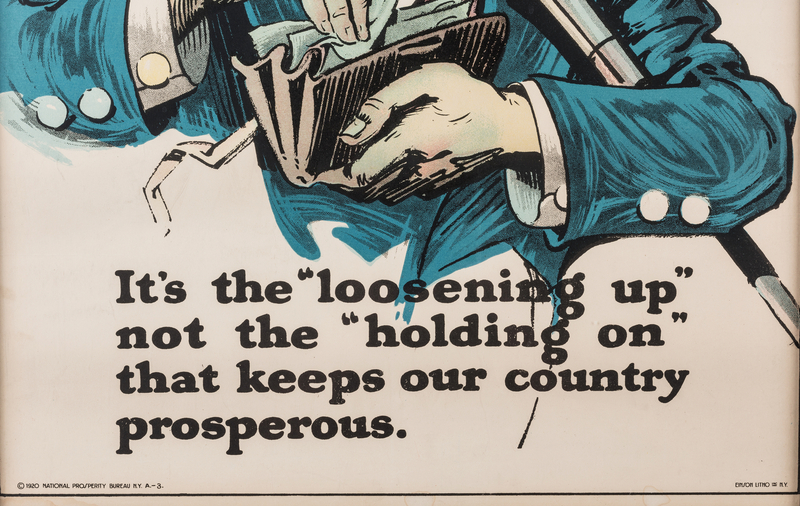 It's the "loosening up" not the "holding on" that keeps our country prosperous". Published 1920 by Einsin Litho, New York. Housed in a black painted wooden frame. 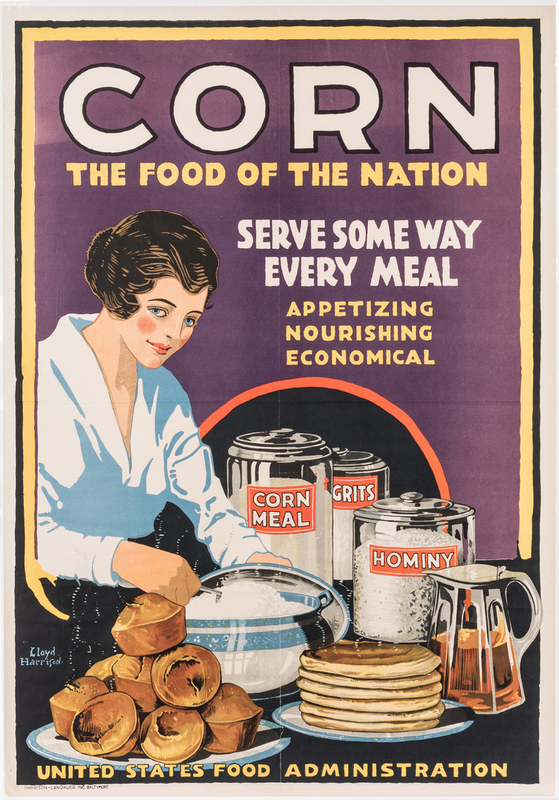 Sight – 25 1/2" H x 17 3/4" W. Framed – 26 1/2" H x 19 1/2" W. 2nd item: US Food Administration Poster depicting a poster showing a woman serving various corn related items with canisters on the table labeled corn meal, grits, and hominy and reading "Corn, the food of the nation. Serve some way every meal: appetizing, nourishing, economical." Designed by the artist Lloyd Harrison and published by Jarrison-Landauer Inc. Baltimore, 1918. Unframed. 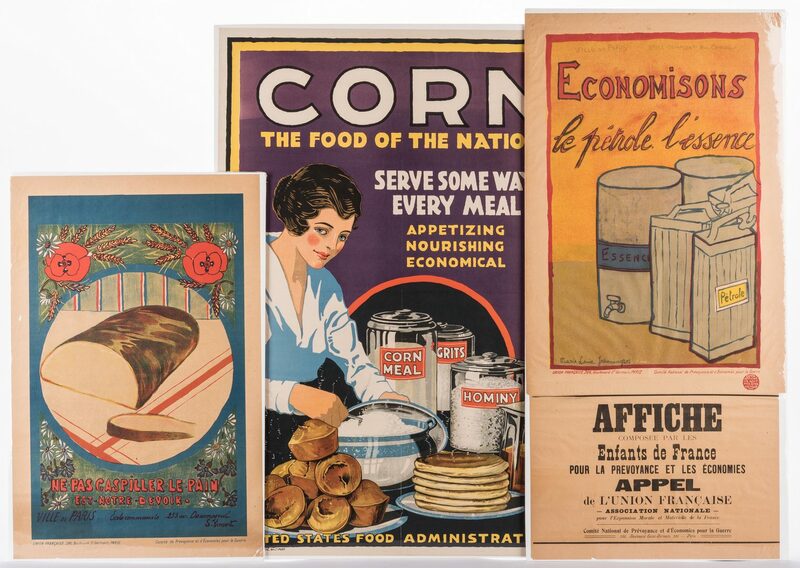 Sheet: 30 1/4" H x 21" W. 3rd item: WWI era French poster depicting a group of gas containers titled "Économisons le pétrole, l'essence" or "Let's Save Gas". Designed by the artist Marie Louise Jeanningros and published in Paris by the Comité National de Prévoyance et d'Économies, 1914. Addition to the bottom of the colored poster reads "Affiche composée par les enfants de France pour la prévoyance et les économies.". Unframed. Note: This poster was from a group of posters designed by school children and others, some marked "Affiche composée par les enfants de France pour la prévoyance et les économies." 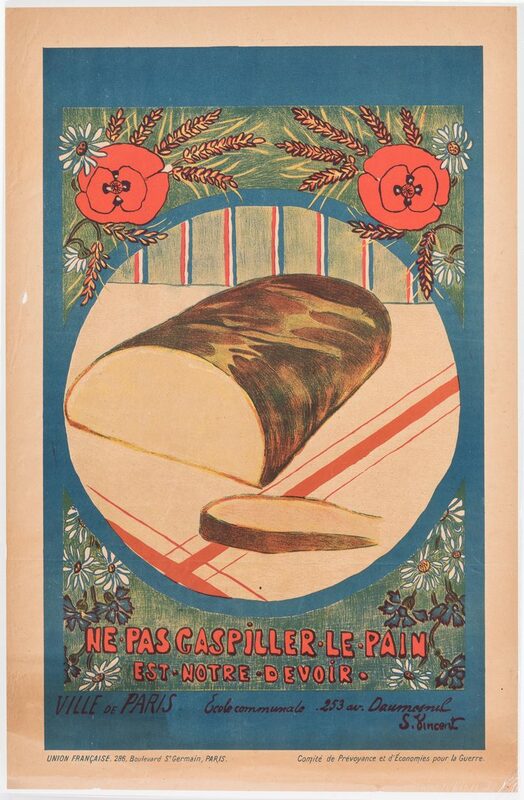 Sheet: 31 3/8" H x 15" W. 4th item: WWI era French poster depicting a loaf of bread on a table and titled "Ne pas gaspiller le pain" or "Our duty is not to waste bread". Published in Paris by the Comité National de Prévoyance et d'Économies, 1916. Unframed. Sheet: 21 3/4" H x 14 1/4" W. Provenance: Private Knoxville, TN collection. 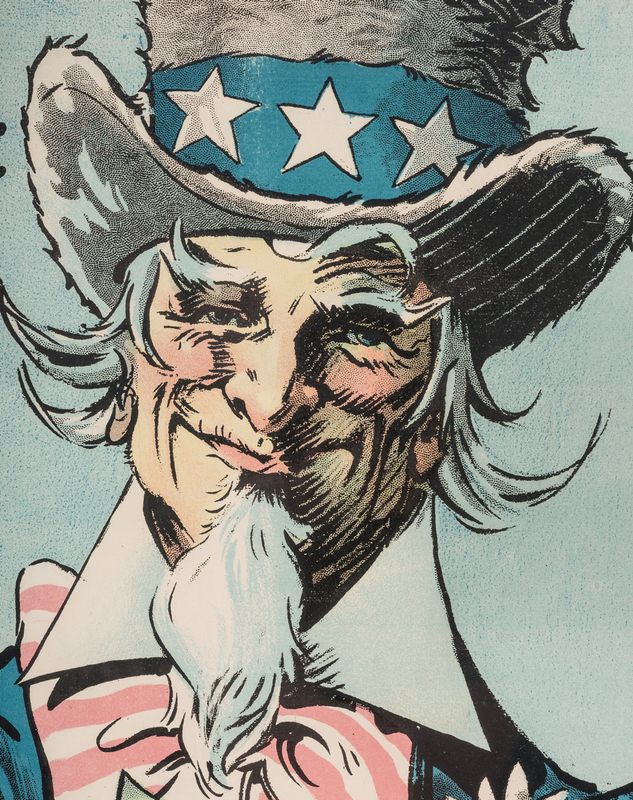 CONDITION: 1st poster: Some dampstains lower margin and lower left corner, minor toning. 2nd item: Overall toning. Creasing from folds. 3rd poster: Overall toning. Margin losses upper right corner, minor losses lower margin. 4th poster: Overall toning, Very minor margin loss lower left.